The owners of this home sought to restore the kitchen of their historic 1912 home to its original style. 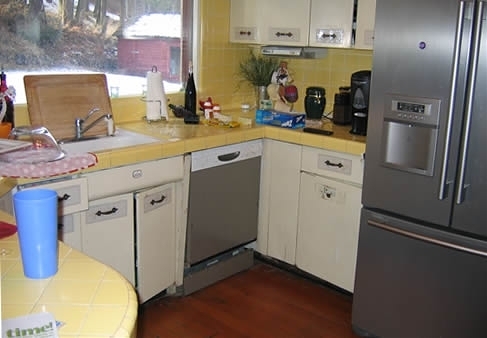 The project entailed gutting the 1950's style kitchen, including yellow tile counters and metal cabinets, restructuring the ceiling and floor system and establishing a more efficient work space. We created an opening in the wall between the kitchen and dining room for a more social environment and installed new quarter sawn hardwood floors to match the existing historic floors. The intricate glazed custom cabinets extend up to the ceiling and include unique glass cabinet doors and a distinctive hood vent. An island was added with furniture style cabinets and a two-drawer refrigerator. Other features include granite countertops, crown molding and a countertop windowsill. This kitchen remodel was designed by Nancy McKennon.